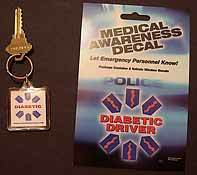 A portion of all proceeds from the medical awareness decals and key chains will be donated to the American Diabetes Association and the Juvenile Diabetes Research Foundation. Questions? Contact D.A.D. 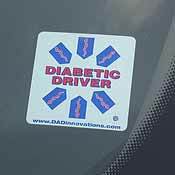 Innovations today about the below diabetic driver products. Our brand new license plate frame is now available. Letters are 3/4" high and very easy to read. We are happy to announce that our decal is now available for the outside rear window. Size 3"X 3", UV protected. Not recommended to be put on paint. We are happy to announce that our popular decals are now available in your choice of 2 sizes: 3" x 3" or 2 1/4" x 2 1/4". Each pack contains 2 decals. 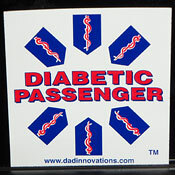 Want to inform emergency personnel that your child has diabetes? Buy our new 3" x 3" decal. These decals go on the outside of the window. 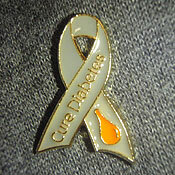 Show your support to Cure Diabetes by wearing this pin. Size of the pin is 7/ 8" X 1 / 2" and is cast in pewter with gold trim. 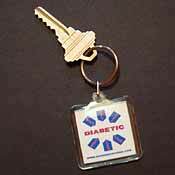 You have your choice of a key chain that says "Diabetic" or "Diabetic Driver". Can't make up your mind? 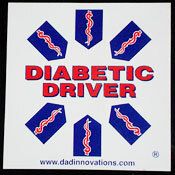 Buy a set that contains both the diabetic driver car decal and a diabetic driver key chain. Choose from 2 sizes of car decals and 2 types of key chains. Use it as a key chain, put it on a backpack, lunch box, suitcase. For younger children, use it as a zipper pull for coats or attach it to a car seat.